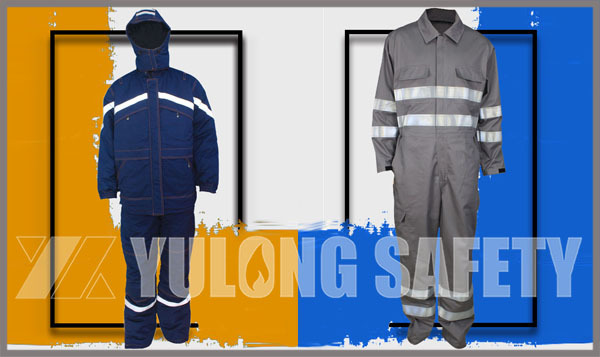 You Are Here: YULONG SAFETY > News > How to select work clothes according to the the work? How to select work clothes according to the the work? Reasonable wearing work clothes can help regulate temperature, protect skin to achieve the purpose of water resistance, fire resistance, heat radiation, antitoxin and rodent resistance. The rationality of work clothes is directly relative to human health. When working in high temperature, under high thermal radiation environment, the work clothes should be white color or other light colors, and the fabric should be heavy and soft fabric. In addition, in high temperature environment, some people sweat a lot and always like to work without upper garment, which will make the skin hurt by the heat radiation, and lower the radiating function. So the work clothes not only should be worn under high temperature, but also worn with thicker long sleeve clothes and glove, even masks or foot masks. Mechanical workers always work in machines conditions, it is necessary to prevent the clothes hurt from the machine and make the clothes rub resistance. Therefore, it requires that tight clothes, the hem, cuffs and trouser legs can buckle up together, the fabric should be strong, rub resistance and deep color. Engaged in chemical production workers or laboratory officer work in the corrosive substances and Laboratories, except the thick tight sleeve clothes, also have to wear rubber apron, rubber gloves. It should be also wear rubber work clothes with headgear in necessity. When agricultural production workers work for general outdoor work, light-colored denim or khaki overalls is better. Forest workers should wear tight clothes, collar, cuffs, angle should be tightened to prevent insect attack. Cooks and food workers should wear white, with buckle in back clothes, the requirements are long knees, cuffs can fasten, and wearing hats, masks, which can strengthen the cleanliness and prevent food contamination. Except the nature of work, when choose the work clothes, also should be noted special clothes wear in special work place, work clothes is for work place, can not take home, to prevent the germs or poisons spread. The work clothes also should be maintained clean, tidy, wash frequently, mending, to ensure the protective clothes play its role.